Some days ago, I was teaching a class and a student who had probably been held up in a lecture in another faculty came in. As she was walking to a seat, I noticed she had this retro look. Her hair was plaited in one of those styles women did in the 1970s. The only difference was she used wool, which is in vogue now, while cotton thread was used back then. Once in a while you see something like that. Someone who is brave enough to go against the norm and stand out from the crowd. I mean that in a positive way, of course. I would never endorse deviance that tends towards illegal or immoral conduct. But it’s refreshing to see someone do something in a unique way or remind us of pleasant long-forgotten stuff as the young lady in question did. Right there in the room full of ladies with all kinds of wigs and weave-ons, some might say she looked odd but I say she had the courage to be different. She kindly sent me some pix she took with that hairstyle and a chic getup. I’ve added a few of those here. Lovely, don’t you think? It’s to be expected, though, as Chisolum Ugezu (her name) loves fashion and posing for shots. She is the last child of Mr & Mrs M.C. Ugezu and hails from Enugwu-Ukwu in Anambra State. The youngest child in a family is often perceived as spoilt and lazy but this one is as hardworking as they come. 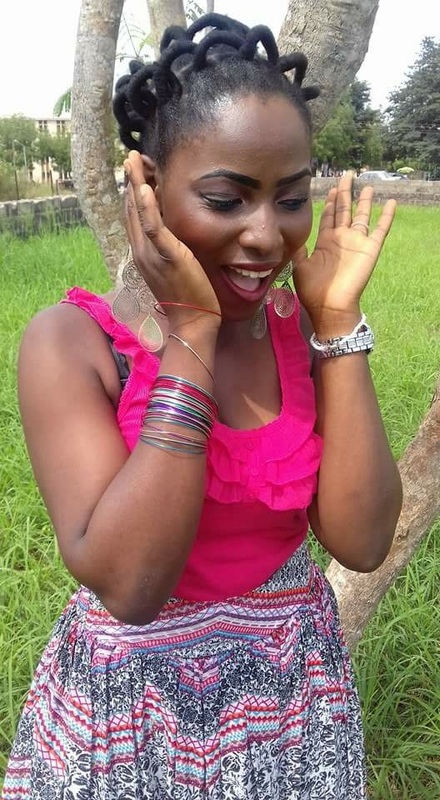 Besides being a third-year student of Mass Communication at the University of Nigeria, she makes beads for sale, has a budding acting career (she has been featured in the home movies Royal Banquet, Moment of Agony, Echoes of Love, etc.) and aspires to be a model and broadcast show presenter. 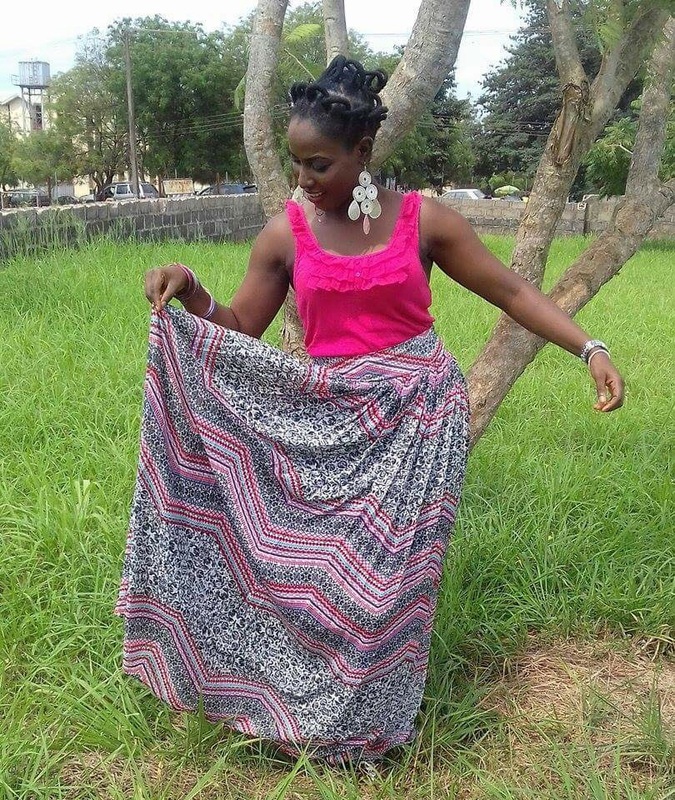 She also dreams of becoming a fashion designer and a Nollywood superstar. Hmmm… lots of dreams, but all achievable by God’s grace! 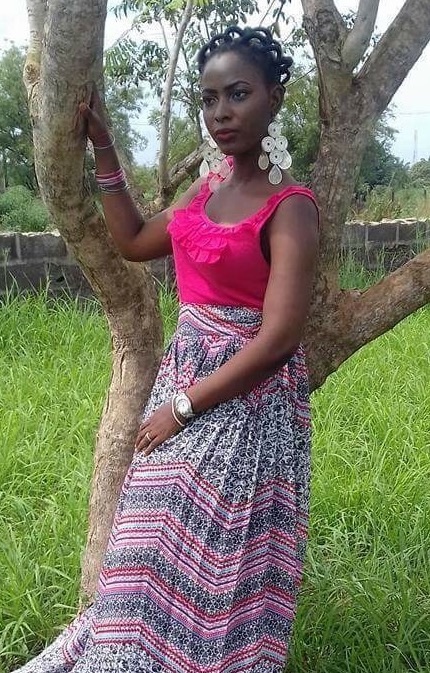 We wish her success in her studies and other pursuits in Jesus’ name. Do you ever do that, I mean, strike out on a unique path? Or are you content to be like others? I ask this without judgment. Just curious. Have a beautiful weekend and be richly blessed of the Lord in Jesus’ name. Oh yes! Bless you, John! Have seen Chisom several times her dressing is always unique and she is a very pretty and adorable lady. Right! You are blessed, Oluchi! courage though heard of everyday is a rare virtue..i feel inspired by this post, bless you ma. Lovely comment. You are favoured, my dear, in Jesus' name. You would know, after all you're in the beauty business (Makeup artist, right?). More power to your elbow and God's abiding presence in Jesus' name. Hello, this is a beautiful story, I must say. Beautiful not because of your apparent wit - which is clear - but for the singular reason that it inspires, just like many other of your stories. I am greatly intrigued, and moved. I am imagining the effect or impact of this on the object of your story. If she is anything at distance from what you portray here - which I don't imagine - then she is, with this, held to a pint of responsibility. And on other students and the public? My imagination is wild, in a good way. Thank you Mrs. Edith Ohaja. Well done. May the blessings be! Thank you, Ikenna. You are blessed! And the title is Ms. The young damsel is good to go! I was also thrilled when I first saw her in that attire. Thrilled is the word. Cheers! The hairstyle really looks good, She v'e got a whole lot of talents. God bless her. Amen. And bless you too, Martin! Courage always helps us stand out with a difference, and courage boosts confidence. the lady in the pictures is beautiful. Yes, she is! A true black beauty! Beauty is from within. She is an epitome of it. I am inspired by her courage, carriage and intelligence. Beautifully put. Bless you, Miriam! Inspiring, I must say. With the human paradigm, you drew your story closer home, and closest I will say, on the instance of the hardworking girl you just used as an example. To be different, it is appropriate to use the word "dare" because it is such a difficult and fearful course of action. We often fear the eyes that look at us, and therefore succumb to the ease of following the crowd. Yes, we often prefer to follow the crowd, don't we? When majority rather chose to follow what is in Vogue, she mustered the courage to be different. It is commendable. She refused to be swayed by the wind of change which has flung many to distant places. Bless you, Gideon! The point is, some may love that hairdo but would not dare wear it for fear of being laughed at. Wow! This is beautiful. Chisolu I wish you good luck. Yeah, she is really lovely to look at and works pretty hard. Chisolu... Well nice name I will say... And a charming look. I guess because of the traditional hairstyle you have there. Right! She does look great. Her attire baa? It's lovely! Courage is the only key to being outstanding.... it really pays to be hardworking and filled with inspiration for the future not looking at only the present. It's a lesson for many youths who want a table laid before them without doing a thing. Praise God, the chick fine well well! I know chisom as someone who doesn't joke with her looks. Keep it up babe. I don tell them already. Lol! Indeed,chisolum is one of those few girls that wear any hairstyle whether trending or not as far as she looks good on it.her confidence and carriage really amaze me.she doesn't dress to please anyone.funny enough guys still compliment her hairstyle though it's obsolete.indeed this piece is very inspiring.it really educates we young girls on d need to be confident in everything we do.thank u ma for d wonderful piece. Yes, Chisolum is always unique and it's part of her. I love her courage to be different. nice outlook Chisolum. I love your outfit, the colour combination. And your hairstyle is cute, even from the packing style. 'e' make sense dear. May the Almighty help you as you push forward in accomplishing your dreams. There's beauty in being your own person. And it's obvious she's her own person. I love her courage. The hair made her so beautiful and unique from others. I once made a hair style similar to that. Nice one. Courage is a rare virtue and she is her own person. I was thrilled and amazed when I first saw her in that attire. Dare, she did. Noticed and admired, she was by all. This post, though centered on Chisolum, is a call to be daring in a monotonous world of trends. Truly, it costs little to look different. Give it a try today..........?? It takes courage to be different. We stand out when we are not afraid to show the world who we really are. She's comfortable in being herself and that speaks a lot. hey guys, that's my kid sister, chisolum. i watched her grow up. look at her, she's big now. very soon, wedding bells will be ringing. for sure her husband will pay double pride price. thanks ma'am for featuring her. I no know say dem dey steal sister oh! Lol! Yeah! The short story is incredible! I also have something too but i'm sure it's lame. Lots of dreams!! Quite impressive. nothing more sweet than having a sister like her with beauty, brains and a good sense of culture. So many people are working hard to achieve their dreams .my only prayer for these hsrdworkers is that,God should crown all their hard work with sucess.im not excluded in this prayer. It takes boldness to do such a thing. As for me, I think it's very encouraging considering the kind of generation we find ourselves in and i'd like to say more power to her elbow. When one chooses to stand out, you can't help but give attention to that person. Hardwork and God's grace is all that Chisolum needs to succeed. It pays to be unique and I must confess she is beautiful. Wow! It is not easy to look different in your own style, i love this. her hairstyle is very beautiful, although in this present age people would have thought it to be weird and seen her as local, she really looks pretty embracing the unique African hairstyle. i admire her courage and aspirations, more power to your elbow, chisolum, and thank you, ma, for bringing this beauty to light. its cool to be different it gives you a trademark. Success to you Chisolum! It really requires a lot of bravery to go against the tradition that is prevalent around you, i really love the hair style of the young woman. She really did something unique unlike the common weavons and brazilian hairstyles that young girls of today would kill for. Most times it requires strength to be different and not feel like a freak, thumbs up! to the young lady once again. Yes i agree with you ma. Once in a while one needs to be unique and stand out among others. Some people may say that being unique is being odd or being childish but i think its okay for a person to chose to be unique. Being different to me is being special in your own way. And a person who is different knows how to trust in him or herself and always stand on her own words. People always want to go with the crowd forgetting that they can draw the crowd to themselves if they can stand out and be different in a positive way. Some people may cower and not stand out but would admire those who do.This post says Be Unique! Be different! !There is beauty in uniqueness. Nice one, Ma. Chisom is a bold girl her hair style is unique. sometimes we have to do things that will makes us to be unique and different from others. chisom may God grant you your heart desires. I love her courage.Its perfect and unique.Honestly,I dont think i can make the hairstlye.Its really nice to be outstanding. One must never forget that it's our differences that makes us unique, some don't like you being different especially if it's a good difference and would love to pull you down but we are made to understand from the post to never allow anyone to put you down because of the way you look or sound. Wow! i really love her courage. not everyone has the desire to go for an african hairdo. It's made me come to a decision to try being African once in a while and be proud of my African heritage. The decision to stand out is one very difficult one to make, but upon implementation, the results are really outstanding. Meanwhile, the lady in those shots shares much resemblance with one 'Elizabeth', a one-time contestant on the MTN project fame reality show, season 9.
i dnt really know why i love this story so much ...its stort and simple but of so much interest to me..it really inspires me so much to work hard and dream big ....maybe it's because I'm a last born like she is. yeah, that the reason #lol.. I love Chisolum, she encouraged us to value our culture, to learn how to look simple and also to be ourselves. Chisolum Ugezu is a good example of a courageous, confident and enterprising young lady. very beautiful write-up. It's good to leave the crowd and do something different sometimes. this one has great courage to have made this hair in this computer age, lol. Thank you, ma, for this. We are all different, but making a positive difference can only be done by doing or saying something spectacular or strange. So long as it makes a positive change in society, it's good. I see the girl as someone who loves our old way of doing things and tries to do it. Generally, Aunty Edith is a woman that has the fear of God and encourages others to do so. This is seen in her speech and writeups. Keep it up ma, I love you. she is courageous and outstanding, living her life not minding what people will say. one important thing i derived from the story is the fact that people will always see you the way you see yourself. she is contented with her qualities and that's what matters. nice one, ma. This is so beautiful,looking beautiful and unique. To be different is not only in character but it covers all aspects. her hair style made me know that some people out there somewhere still value our culture which is a way of life of people. it is very good to appreciate one's culture and the place you come from instead of getting so engrossed in the western way of life all the time. dare to be different in all aspects of your life and always learn to appreciate things that you have and things made here...........Bravo! : This is true. A lot of people have forgotten their cultures and portray the white man’s culture. These days, fellow Africans see African clothes as archaic but we should not see things this way if we want our culture to progress. We should be proud to be African. She is pretty. It is her decision to be natural and I think she is actually okay with it. Though it is rare to see ladies in her looks, but I think there are still more of her type out there who chose to be natural.